Breastfeeding moms, rejoice: Transporting breast milk when you travel could get much easier soon. And for breastfeeding moms, there's the fear of having your pumped milk confiscated at security, which happens far too often to moms who are traveling with their children or on their own. 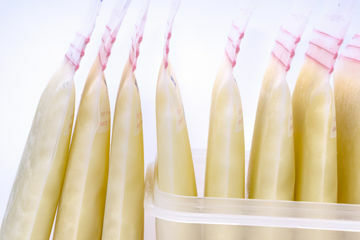 Breastfeeding women know all too well how difficult it is to pump and store milk that can be used when you're away from your baby, and having it taken from you isn't just frustrating, it could also present logistical issues for moms and their babies. Despite the fact that TSA's web site encourages moms flying with breast milk or formula to simply alert a security agent, it's certainly not unheard of for breast milk to get taken from a mother. Case in point: Alyssa Milano's experience. But that may change: The Babies and Breastfeeding Equipment Screening Act has been introduced—and under this, TSA officials will be told they must allow moms to fly with their breast milk. According to Rep. Jamie Herrera Beutler, who introduced the bill, there's been an issue with compliance among TSA workers who may not have known that moms should be allowed to fly with their milk. “For parents, working moms, care takers, air travel can present its own unique challenges and to accommodate these challenges, the Transportation Security Administration—or TSA—has important exemptions in place that allow passengers to bring breast milk, bottles and feeding equipment through airport security and on board the aircraft," Rep. Herrera Beutler says. "There have been too many instances reported by parents that TSA officials either didn’t know or simply refused to follow these exemptions. Parents who are trying to follow these rules are consistently singled out for harassment-like scrutiny by TSA. This has led to breast milk being forcibly tossed out, equipment being broken and flights missed. A family following TSA’s posted regulations shouldn’t have to have their breast milk thrown out or shouldn’t have to endure the terrible nightmare of missing flights while they are traveling with kids because of the lack of training on the agency’s part." According to The Washington Examiner, the House passed the bill, which will head to the Senate for approval next. PopSugar reports if it's passed, TSA will have 90 days to make sure all security officials understand the rules surrounding the transportation of breast milk. You know what that means: There's a good chance you can start planning your next stress-free vacation very soon!